Unique, preserved textiles from the Pacific Islands are coming under the microscope courtesy of an innovative collaboration between textile conservation experts at the University of Glasgow, botanists at the Royal Botanic Gardens, Kew, and barkcloth specialists at the Smithsonian Institution in Washington, DC. The project is supported by a major grant from the Arts and Humanities Research Council (AHRC) and will run for three years from November 2015. Frances Lennard, Senior Lecturer in Textile Conservation, will lead the project. Barkcloth is a very distinctive art form and close study of it can tell us a lot, not only about the plants that were used to make the materials, but also about the people who made them. We will investigate the history of Pacific barkcloth, also known as tapa cloth, which is made from the inner bark of the paper mulberry tree and other plants. By studying the material closely, it is hoped that we will gain new insight into the lost skills, culture and knowledge associated with this ancient craft. Inhabitants of the Pacific Islands have produced barkcloth for around 5,000 years, for use as clothing, furnishing and ritual masks and garments. 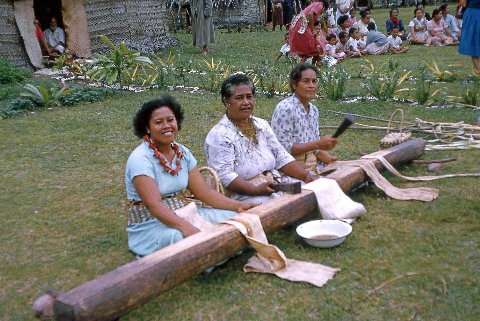 However, it gradually fell out of favour as a result of increasing Western influence and today the skill of making barkcloth has been lost in many of the Pacific islands though the material is still used across the region as an expression of cultural identity. Beating paper mulberry for tapa in Tonga. Photograph by Adrienne L. Kaeppler. Tongan ngatu presentation following the mautohi ceremony (signing of the marriage license) for the wedding of the Crown Prince Tupouto`a to Sinaitakala Fakafanua, July 10, 2014. Photograph by Linny Folau of Vava`u Press. Barkcloth was widely collected by nineteenth century visitors to the Pacific and today there are good collections in western museums. However, barkcloth is often poorly understood. We are interested in finding out whether materials, techniques and designs originated from particular islands, how they were transmitted around the region and the effect of globalisation on this tradition. We will also try to identify which plants were used to make the barkcloth using state-of-the-art techniques including protein and DNA analysis and isotope analysis. 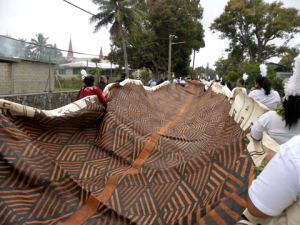 The information will benefit museum collections in the West and contemporary makers of barkcloth in the Pacific. Conservators from the University of Glasgow’s Centre for Textile Conservation and Technical Art History, and the Smithsonian Institution’s National Museum of Natural History will share their expertise in caring for tapa cloth and apply it to two of the UK’s major collections of historic tapa cloth, The Hunterian in Glasgow, and Kew’s Economic Botany Collection. 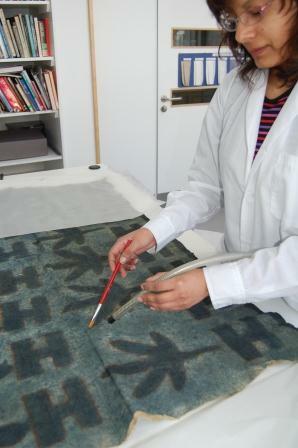 As part of this work they will research the material’s properties and develop conservation treatments. Results from the project will be freely shared worldwide via a website, as well as by publications and conferences. 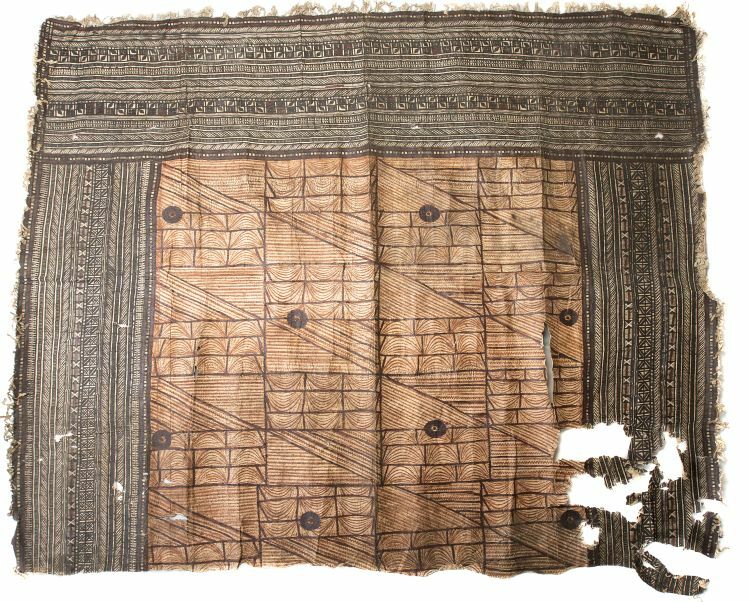 Tapa cloth textile from Fiji. The Hunterian, E458.3. © The Hunterian, University of Glasgow.